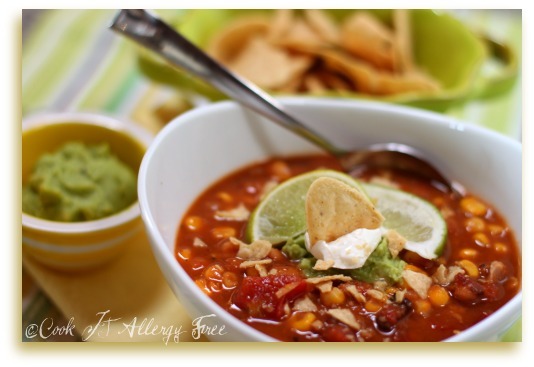 This New Year’s Day I decided to ring in 2011 with our favorite Gluten-Free Dairy-Free Chicken Chipotle Tortilla Soup Recipe. Why? Because it is so easy. And? Because it has been so darn cold here. And? Because it is really healthy. And? Because it is so easy. Oh, did I mention that already? Well, that point bears repeating. For me, New Year’s Day is not about getting busy achieving goals or hopping on the treadmill or spending hours cooking in the kitchen. Nope. That is what January 2nd is for. For me, the first day of the New Year has always been about relaxing (and really, by relaxing I mean being lazy), setting intentions (that will not start until the next day), eating soup (that is easy to whip up), staying in pajamas (and not feeling guilty about it), letting laundry pile up (and not caring that my darks are mingling with my whites and unmentionables), watching all of the Bowl games (and rooting for certain scores, not teams, to win our football pools), and spending all day with family and friends (who will often show up in their pajamas, too, per my request). Yes. January 1st is my favorite day of the year. This one day holds so many promises and a total anticipation of what will lay before us in the next 364 days. This is the day that we feel such hope for accomplishing all of the intentions and goals that we are setting in our minds, writing down on paper, or putting on our Vision Boards. It is on this day that we feel that all of those possibilities and dreams are completely within our reach. And, this year, as the days tick on to the weeks, then the months, following, let us not lose sight of these promises that we have made ourselves. Let us set one more goal: to help remind each other to stay on track and achieve what we had hoped for on the very first day of 2011. Do you think we can do it? 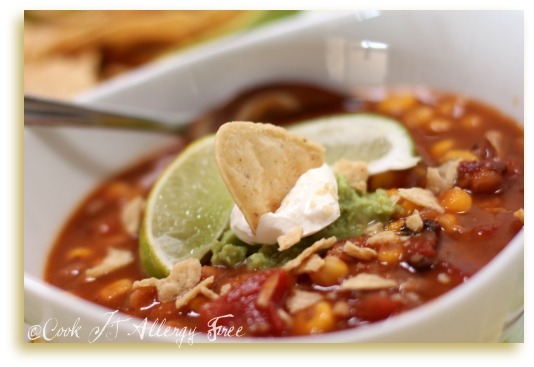 And since many, or, dare I hope, most, of us have all said that this will be the year that we will focus on real food and healthy eating, let’s start with this recipe for my nutrient packed Easy Chicken Chipotle Tortilla Soup. 1. In large saucepan, over medium-high heat, combine tomatoes, salsa, and chicken broth until just beginning to boil. 2. Stir in cannellini beans, refried beans, cumin, and corn. 3. Once again, bring mixture to a boil, then reduce heat to low and simmer 15 minutes, stirring occasionally. 4. Add shredded chicken and chopped greens and heat through. 5. Spoon into bowls and top each with a handful of crushed tortilla chips, a spoonful of sour cream (or omit for Dairy-Free), a lime wedge, avocado pieces, shredded cheese (or omit if Dairy-Free), and chopped cilantro. NOW…ARE YOU WILLING TO SHARE SOME OF YOUR GOALS HERE, IN THE COMMENTS SECTION? I WILL IF YOU DO! Ooh, this looks wonderful. I’ve been so into soups this winter as my first in the Midwest as left me pretty much chilled to the bone! Hmm…goals, eh? Most of mine are fitness related since I feel like after living a lifetime of morbid obesity, I finally have the health portion down (though I do need to lose some more). I’d love to be able to do an unassisted pull-up by the end of 2011! And maybe deadlift 275# (my max is 205# right now). Hi AndreAnnna! I can only imagine what an adjustment it must be to have your first winter in the Midwest. Soup is a perfect remedy for that! I love your goals, especially that unassisted pull-up! As a gymnast for MANY years, I used to be able to whip those out. Now, there would be NO chance. I know. I’ve tried. One of my fitness goals is to be more consistent with my yoga on top of my other workouts. Maggie, my Mom just made this with her Vegetarian twist (and even made her refried beans vegetarian). She said it was perfect! Your goal to spend more time with the kiddos is also one of my top goals. I find that I am often telling them “One more minute” or “Just let me finish this one more thing”. I need to stop doing that and just play with them when they ask me to. Pretty soon, they will be too old to ask anymore. ;( Cannot wait to meet you in April, missy!! Sounds yummy, our New Years was lazy as well. I would like to eat more fruit and raw veggies this year. Although I have fruit available every day I don’t seem to eat it! Hi Intolerant Chef! I so hear you on having fresh produce available, yet not being good about eating it. I am always giving it to my kids, but somehow not as much ever goes into my mouth. That is changing for me this year too! 😉 Thanks for sharing!! What a great looking soup — I can almost smell it’s goodness from here! Mmm, I want…totally going on the meal list for next week! My biggest goals for the year are to pay down credit card debt and have the house cleaned up and more-or-less orderly by the time I’m 25 weeks pregnant (the time when baby *could* survive if born then). The chaos and clutter that abound in my home (though hidden in closets and my own room, lol) make me cringe when I think of bringing a new baby home to this! Your Tortilla Soup looks really good. Thank you for sharing and have a great week! My goal for 2011 is to buy some land and get a house built for my boys and I….No pressure! 1. Listening more. Active, careful listening. 2. Playing more. Relaxing, staying in your pj’s (inspired by you) kind of playing. 3. Listening to more music instead of watching cooking shows (this will be a hard one!). 4. Increasing my exercise to at least 2 days of spinning and 2 days of hot yoga. 5. Planning my meals more to reflect truly healthy, compassionate, and thoughtful choices. And more. Still processing and thinking about it. Now, I’d like to talk about you! When you post a new recipe, I look forward to not only reading and trying it, but also to reading your writing. You are such a wonderful and articulate writer, and you express yourself in much the way you speak. I thoroughly enjoy your style. Keep up the good work!! Ellen, many of your goals sound so similar to mine. And, like you, I am also thinking of more to add so that I can truly make this year spectacular!! Your words about my writing are so wonderful! I cannot tell you how much that means to me. I always know what my intentions are when I write, but not always sure they come across in that same way! 😉 Thank you, my friend. Cucee Sprouts! That Jalapeno Corn Chowder sounds absolutely amazing! I am really looking forward to trying it out! Thanks for sharing it with me here! 😉 Happy New Year! Just had to try is recipe for the two of us. It was so good and so easy to make and there is plenty for another dinner. We each had 3 helpings and now i can’t move. What a treat. Thanks for the recipe. Yay, Mom! So glad you liked it! Tell Michael that I updated the recipe with the cilantro! 😉 See, now you do not have to cook dinner tomorrow night! I love using great salsa to make a dish special. I use it in my chicken tortilla soup (no beans in that one, but I like the “chili” nature of this one). I also just made a shrimp stew which came out great by adding my friend’s homemade salsa, which was part of my Christmas gift from her. Shirley, that Shrimp Stew sounds amazing. Is it more like a gumbo with the salsa added in? I love adding salsa to so many things. I make a yummy crock pot chicken with my mother-in-laws home-made salsa!! YUM! I love your word. I have no doubt that you will do just that this year…ACT!! In fact, i am sure you will exceed your own expectations. Focus, Abundance (not in terms of $$), Gratitude, and Action (last one is similar to yours). I cannot wait to see what happens this year. Wow! What a tasty looking recipe. One of my new years resolutions was to try something new every day. Today I will try this yummy looking soup. Thank you for helping me with my resolutions. This soup looks wonderful. I wish I had the ingredients at home so I could make it tonight. And, I know Max will love it because I, now, have to fight him for my Chipotle Tabasco. Seriously. He won’t eat his eggs without it, anymore. In fact, I think he has eggs just so he can have the tabasco. Still trying to catch up from my Christmas knock-out. But, I have oh so much planned for 2011. Vision board stuff is in a pile, ready to be made. (My first one.) And, lots of lists and ideas. I think I will snag Shirley’s word, ACT. Going to put that in big letters across the top of the board. I love this take on tortilla soup, which is one of my favorites. My goal is to simply find me again. Brooke, I love that goal. I hope you are successful in finding “you” again. 😉 And thanks for the nice words about the soup! I have to wholeheartedly agree that jammies and soup and luxurious relaxation are definitely the way to go on New Year’s day. I look out on the bike bath and just laugh at how crowded it is on that one day of the year. Thanks for sharing your great gf df recipe with the Hearth and Soul hop. That soup looks awesome lady! Tortilla soup is one of Tony’s favorites. I definitely need to make some for him. Alisa, I am so far behind on blog reading. ;( I am planning on catching up this weekend. I was trying to stay on top of all of my other goals. I guess I should stick “Blog reading” on my vision board too! LOL And no. It is never too late to set your goals. Tortilla soup is a favorite of Kurt’s AND his Dad too. Which is why I have to come up with new ways to make it so that I do not get bored. If it was not for my blogging and recipe writing, I would never make a recipe the same more than once. HeeHee! Finished my vision board today! Up on the wall next to my desk. And, I bought the ingredients and am about to go up and make this soup. Yummy! Wow! I got behind and you already left your second comment here. You rock, girlie!! So excited that you got your vision board done! Is ACT in big letters?? I have 4 words on mine this year. I am not quite done with my board yet, though. Saving the rest for my little night with my neighbor gals. Yep. ACT! I also have I also have balance, love, abundance, and success. (Got that from you and The Big Leap.) I liked those words. All of those are awesome words!! I think it is perfect that we are sharing them. Now we can help each other keep on track. Maybe we should make some kind of folder for them in our group – hold each other accountable, you know. This looks so good, Kim! And the photos are spectacular. I know the boys are going to love it. Just came across this today and made it tonight for supper. WOWZA!!! This is delicious! Will become a staple this winter in my house for sure!